Congratulations on the new tree(s) you have. Our society needs more trees. Now that your tree(s) have been installed your probably wondering how to properly care for them. 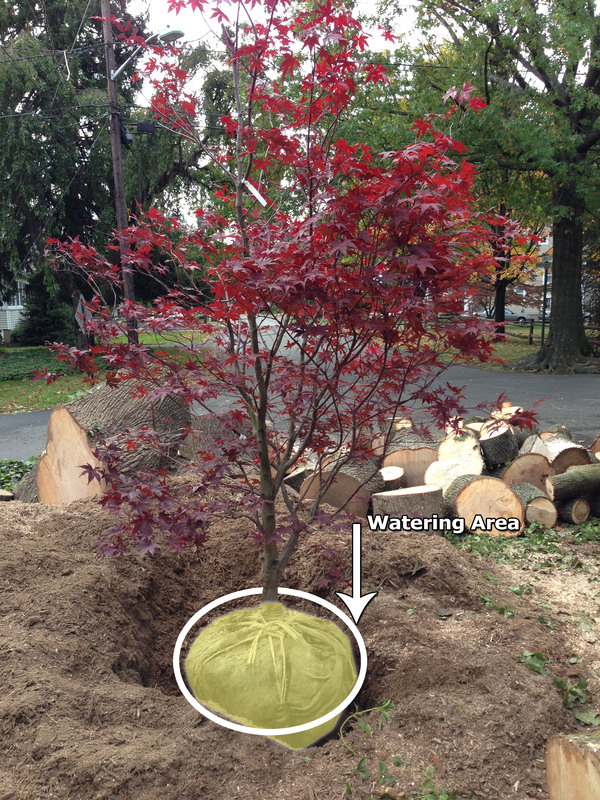 Watering a tree is the simplest yet most critical step in a trees development. 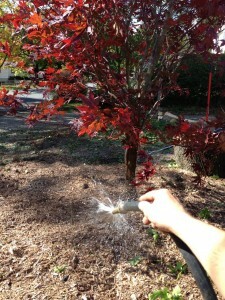 Here are a few quick points on how to properly water a tree. Duration of watering : Spraying a tree with a hose for a few minutes is not the best for a tree. Frequent shallow waterings encourage shallow root growth. If the tree is only getting water in the top layers of soil, that’s where the roots will grow. Infrequent deep soakings are better for the trees development. The deep soakings will encourage deep root growth and will be more strongly rooted. About 15 to 30 minutes should be sufficient depending on the delivery method of the water. Where to water : I always say, “Water where the tree is going, not where it’s been.” I say that because you want to encourage the roots to grow away from the tree and into the new ground surrounding it. The new ground is the environment it will be living in for the remainder of it’s life, so it better get used to it. Watering near the trunk is not recommended because it encourages girdling roots. Time of day to water : Early morning and late evening are the best times to water. How often to water : I always tell my customers with newly planted trees to water it for 15 minutes twice a day for the first two weeks, if there is no significant rainfall. After the first two weeks a tree should receive approximately 1-3 inches of water two times per week. Keep in mind that God waters our plants too. Rainfall and drought are conditions that you need to take into account when watering. You can over water a tree! If the leaves on the tree are wilted dig down a few inches next to the tree and see if the soil is moist. The soil should be cold and moist, not muddy or dry. If it’s muddy your watering too much and you’ll need to lighten up. If it’s dry your not watering enough and you need to step up your game. If you don’t know what your doing wrong you may want to call a professional. 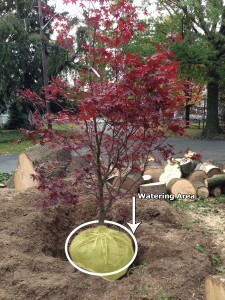 Delivery Methods : The way you water a tree can sometimes be critical for it’s long term life. I don’t want to get too technical here so I’ll keep it simple. The biggest thing is that the tree gets water. Sprinkler systems are great just make sure the systems actually waters the tree. A lot of times the water doesn’t reach the tree. So you may need to turn the system on and make sure it’s delivering water where it needs to go. Oscillating sprinklers are great too. They are cheap and mimic real rainfall. Another great option is just a nozzle on the end of hose with a mist setting. You don’t want to blast the soil with water. That will create soil compaction. 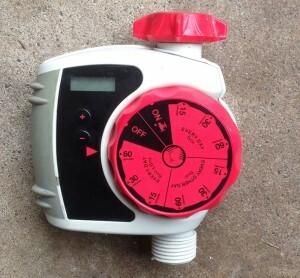 If I were to set up a system for a customer I would use drip line irrigation with a timer. You can get the parts at most nurseries or hardware stores. Drip line irrigation is great because it does not compact the soil and delivers water directly where it is needed.The timer seen in the picture is great because it’s mindless. It is a battery powered unit that will turn on and off at the appropriate times. Like my favorite infomercial once said, “Set it and Forget it”. There are two downsides to this system. You will have to make sure the battery powered controller is on the correct setting, and has good batteries. The next problem is with the drip irrigation. They are notorious for clogging. You will have to monitor the hoses to make sure they are still delivering water. That’s about all you need to know on how to water a tree. Remember to be consistent. 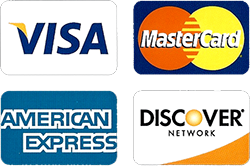 If you are still confused you may need to contact a local nursery, landscape professional or arborist. Or you can shoot me a message. Good Luck! We were featured on Altec’s Advertisement!